Volunteering at Camp Mbube is a wonderful experience for people who want to spend their holidays making a difference. Volunteers—ranging in age from 19 to 90 years old—come from all walks of life and from all corners of the world. They come with a strong desire to make a difference in the world; they leave with friendships and memories that will last a lifetime. Who would most benefit most from a volunteering experience at Tsau Conservancy? Someone who yearns to see more of the world than their back yard. Anyone with a true sense of adventure (living in the African bush is not for everyone!) and who has a flexible and open-minded spirit. Finally, someone who truly wants to make a difference in the world. Each volunteer experience is unique, and much depends on the needs of the Trust, the White Lions, and the cultural centers and schools at the time of your visit. However, we will work with you to help create an experience that best suits your interests, skills, and experience. help monitor the White Lions and assist in ongoing scientific research. work with local schools, assisting in literacy and creativity programs. be a part of the proposed cultural heritage site, and experience the rich Sepedi culture first hand in community conservation programs. take day trips to many of the surrounding areas, including Kruger National Park, Blyde River Canyon, and more. *Please note: the majority of all funds received from participation fees goes directly towards the care of the White Lions. The South African Rand to the US$ averages approximately 10:1, but please check with your banking institution or with currency conversion sites for up-to-date figures. ** Off-site excursions to surrounding areas can be arranged in advance of your visit or after you arrive on site for an additional fee. Examples of these excursions include: Kruger National Park, Blyde River Canyon and the Drakensburg Mountain range (hikes, walks, whitewater rafting), visits to local schools and communities, horseback riding near Adam's Calendar, and more. Click here to request more information about visiting as a volunteer or intern. 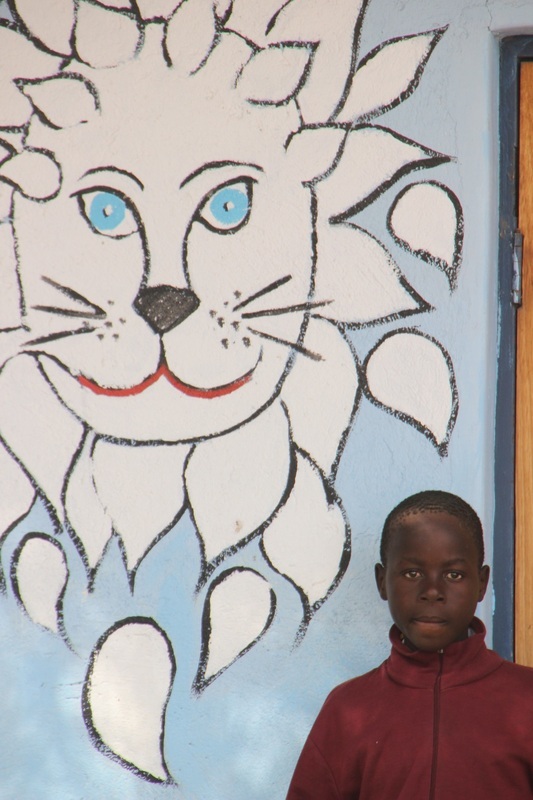 A local school boy poses near a "White Lion" painting facilitated by WLT volunteers. 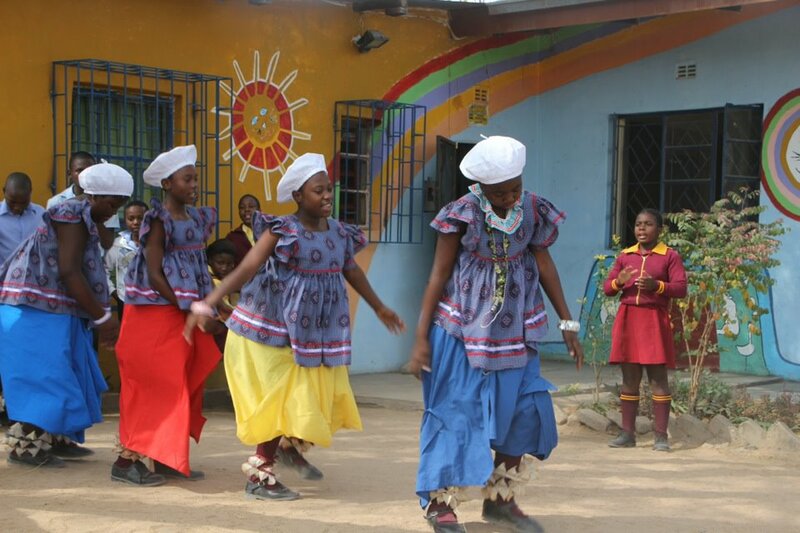 Local school children perform a "White Lion" dance created jointly through the WLT volunteer program. 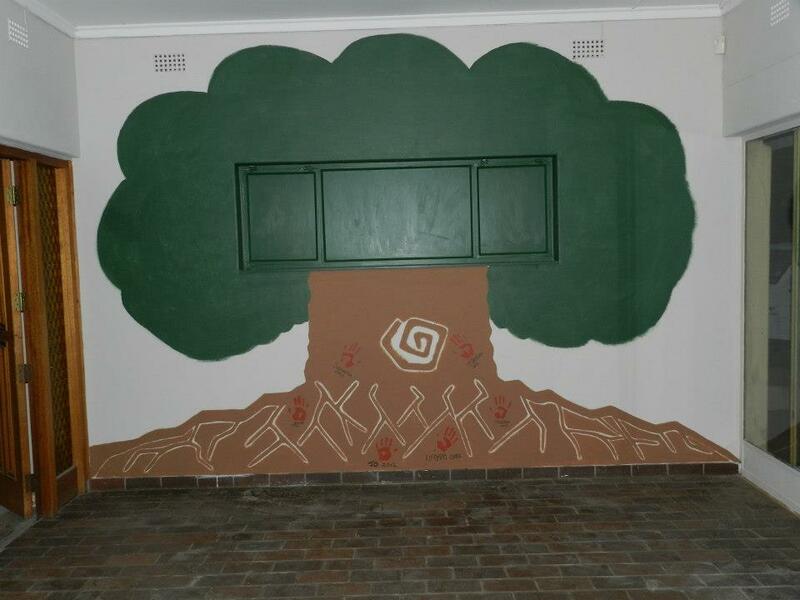 A tree of life painting in the living room at the volunteer camp..